"The Surrender" by Keith Rocco. NPS. On April 9, 1865, after four years of Civil War, approximately 620,000 deaths and more than one-million casualties, General Robert E. Lee surrendered the Confederate Army of Northern Virginia to Lieutenant General Ulysses S. Grant, at the home of Wilmer and Virginia McLean in the rural town of Appomattox Court House, Virginia. 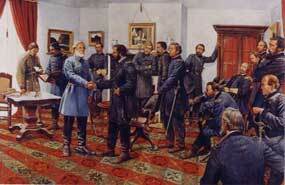 General Lee arrived at the McLean House shortly after 1:00 p.m. followed a half hour later by General Grant. The meeting lasted approximately an hour and a half. The terms agreed to by General Lee and Grant and accepted by the Federal Government would become the model used for all the other surrenders which shortly followed. The surrender of the Army of Northern Virginia allowed the Federal Government to redistribute forces and bring increased pressure to bear in other parts of the south that would result in the surrender of the remaining field armies of the Confederacy over the next few months. On April 26th General Joseph Johnston surrendered to Major General William T. Sherman near Durham, North Carolina (now Bennett Place State Historic Park), on May 4th General Richard Taylor, son of the 12th President of the United States, Zachary Taylor, surrendered at Citronelle, Alabama. On May 12th Captain Stephen Whitaker formally surrendered the final Confederate forces east of the Mississippi (his commanding officer, Cherokee chief and Confederate colonel William Holland Thomas had surrendered on May 9th). On June 2nd General Edmund Kirby Smith surrendered the Confederate Department of the Trans Mississippi to Major General Canby, and on June 23rd General and Cherokee Chief Stand Watie surrendered Confederate Cherokee Indian forces in Oklahoma.